Years ago central Salem was oriented both towards its harbor as well as around an adjacent pond formed by the South River: Mill Pond, which was filled in to accommodate the growing city in the later nineteenth century. 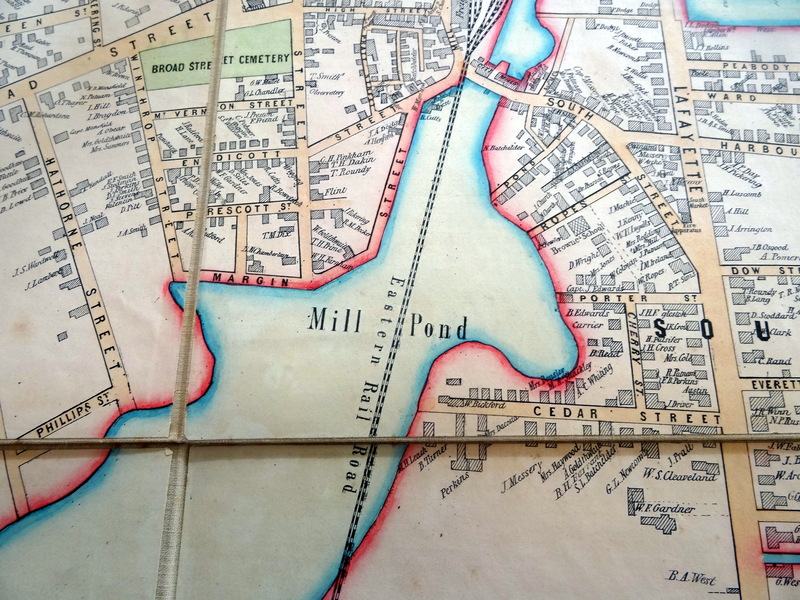 The beautiful map of Salem in 1851 by Henry MacIntyre shows the centrality of Mill Pond, and a neighborhood between Margin Street, the Broad Street Cemetery, and the Pond which is dotted with homes–some large and some small. In the midst of this neighborhood was Mill Street, where a very old and storied house was situated: the Thomas Ruck House, built around 1650 and razed, by my best estimation, around 1902. The Ruck House was not a victim of the larger forces that decimated this neighborhood—the Great Salem Fire of 1914 which singed its western boundary, and the construction of the U.S. Post Office which leveled its eastern part in the 1930s. It was (apparently) gone before both of these events. Given its notability–Salem guidebooks were directing visitors to it because of its importance just before it was destroyed (and in some cases, after)– why was it razed? 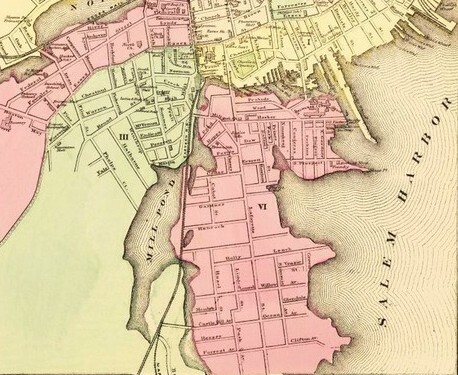 Detail of Henry MacIntyre map of Salem, 1851, Salem Athenaeum; Salem Atlas, 1871 by Walling & Gray; Frank Cousins photograph of the Ruck House from his Colonial Architecture of Salem, 1919; Illustration of the House in Sidney Perley’s Essex Antiquarian, Volume IV (1900); map of central Salem with the Ruck House marked, from Edwin M. Bacon’s Boston: a Guide Book (1903). At this point, I really can’t answer that question, as discreet factors (condition, the will of the property owner) are more difficult to discern than global forces. However, I can offer some historical facts and opinions about the importance of the Ruck House. Edwin Bacon informs his readers that “South of the railroad station is a nest of old buildings in old streets, among them the Ruck house, 8 Mill Street, dating from before 1651, interesting as the sometime hope of Richard Cranch, where John Adams frequently visited (Adams and Cranch married sisters), and at a later time occupied by John Singleton Copley, the Boston painter, when here painting the portraits of Salem worthies”. Adams and Copley, quite a pedigree right there, and the house was also owned by Samuel McIntire’s father. 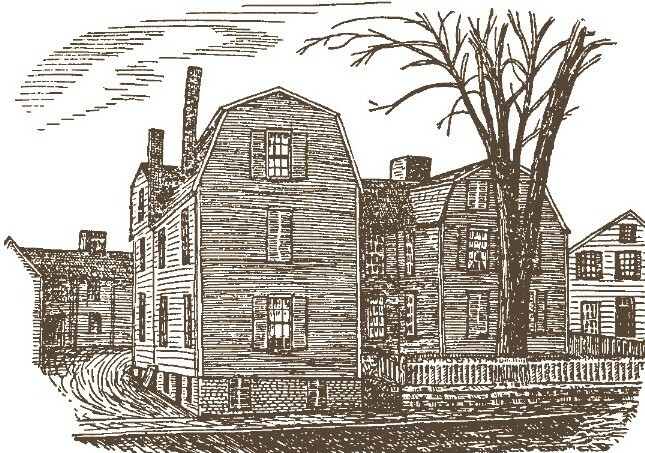 Adams writes about the house in a journal entry from 1766: “Cranch is now in a good situation for business, near the Court House….his house, fronting on the wharves, the harbor, and the shipping, has a fine prospect before it.” Obviously that prospect changed dramatically with the filling in of Mill Pond, but the house retained its stature. 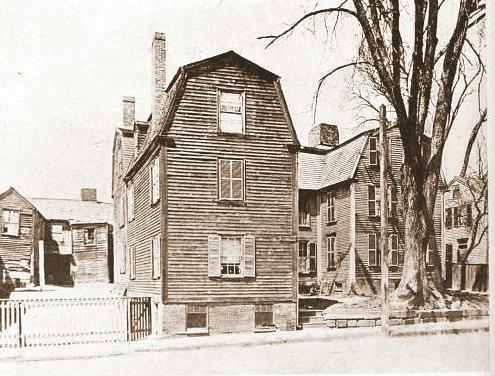 The influential Salem architectural historian, photographer, and entrepreneur Frank Cousins asserts that: “In its U-shaped arrangement with wings of unequal length and virtually three gambrel-roof dwellings in one the Ruck House, number 8 Mill Street, has few if any parallels in American architecture”. Now here is where I am confused: Cousins is writing (in 1919) as if the house was still standing, but an article in the Boston Evening Transcript dated October 30, 1902 clearly states that it had been demolished, along with another notable Salem landmark, the Shattuck House on Essex Street. 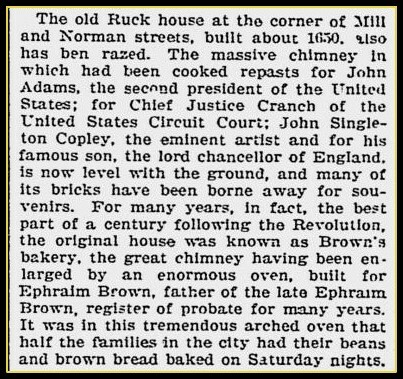 In addition to the great reference about baked beans, this article is just what I’m looking for–early expressions of a preservationist consciousness in Salem–but obviously I still need more information about the razing of the Ruck House. Boston Evening Transcript, October 20, 1902. 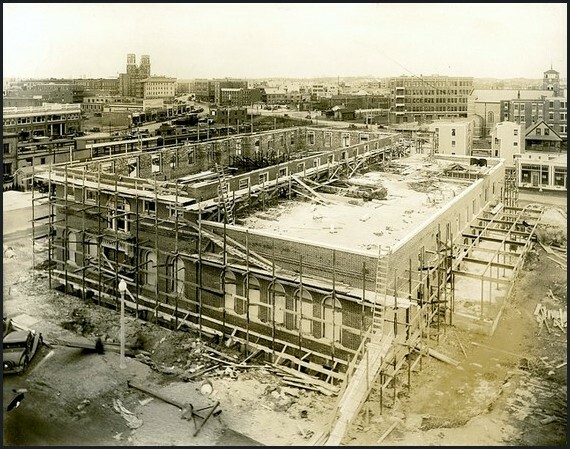 What came after: the construction of the Salem Post Office, c. 1933, Dionne Collection at Salem State University Archives and Special Collections.